I can’t say whether August Wilson won the Pulitzer Prize for The Piano Lesson because of its moving portrayal of a 1930s black family haunted by their slave past, or for his captivating characterizations of a family circle that could be of any color, era or status. The power of both achievements is undeniable. When Boy Willie unexpectedly arrives at his sister’s Pittsburgh home, he’s all swagger and inconsideration. He’s on a mission to sell watermelons to city whites so he can buy Mississippi land from the family who owned his grandfather 80 years before. He expects his sister to give up the family heirloom, an upright piano, to finance his purchase. His sister Berniece greets him with hostility, all cool, Northern disappointment to his Southern heat and charm. The siblings’ motivations reveal themselves, occasionally through mere exposition, but mostly through meandering stories told and sung by their Uncle Doaker and flamboyant Uncle Wining Boy. With just one past between them, brother and sister strain against each other, wanting to choose different paths forward, neither quite toward vengeance or forgiveness. As Boy Willie, Carl Cofield commands the stage with a compelling narcissism, while Roslyn Ruff must hold herself close as his stony-faced sister. Both performances are tremendous. It is also a pleasure to watch Geoffrey D. Williams as the preacher-suitor, Glenn Turner’s Wining Boy, Chuck Patterson’s Doaker and Warner Miller as family friend Lymon. All fully inhabit the soles of their characters’ beaten leathers. Russell Metheny’s set of the small Pittsburgh home and Karen Perry’s period costumes are exquisitely crafted. Some of the furniture and dresses, however, suggest an affluence not to be achieved on a maid’s or porter’s salary. Throughout the play, subtle light and sound cues add to an affecting stage reality that is broken briefly in a supernatural climax. Director Seret Scott conducts her cast artfully through musical digressions and humorous asides that layer our understanding of the family’s pleasures and pains. The tension between the siblings builds to a scary, funny, otherworldly intervention. 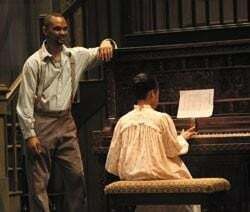 The Piano Lesson continues through March 15 at the IRT, 140 W. Washington St. For tickets, which start at $32, call 317-635-5252 or go to www.irtlive.com.